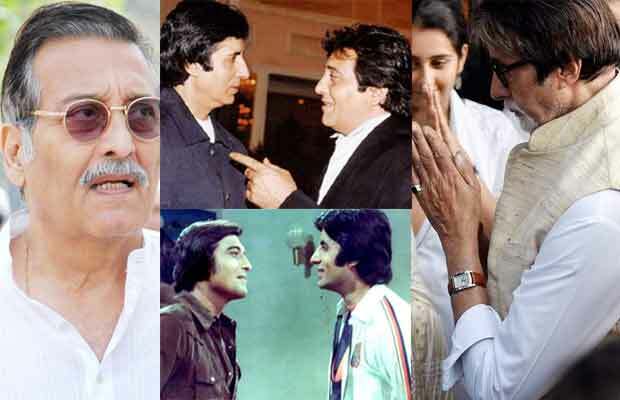 Amitabh Bachchan Shares His 48 Years Association With Vinod Khanna In This Emotional Post! Vinod Khanna and Amitabh Bachchan were labeled as ‘enemies’ during 1970s and 80s when they were both establishing their careers in the film industry. But clearly that is not the case and as Vinod Khanna has said in his earlier interviews that they, he and Amitabh Bachchan were “competitors but not enemies”. Together they have acted in some extremely memorable and hit films like Amar Akbar Anthony, Parvarish, Khoon Pasina and Muqaddar Ka Sikander. Very few were actually aware of the strong and deep bond the two shared. In the words of Big B, it was a relationship of 48 years. But on Thursday, this long relationship came to an end after Vinod Khanna lost his battle with cancer and left a void in Amitabh Bachchan’s life for whom he was more of a friend than a colleague. As soon as Amitabh Bachchan heard of Vinod Khanna’s demise yesterday, he left his interview midway to be there with his family in their grief. Later in the day, a sad Amitabh wrote an emotional message after losing his dear friend. “Respect and Affection! Today is the day when I saw a 48-year-long relationship going up in flames. So, today I find every word of your creation a mirror to the truth of human life. (referring to a poem penned down by Prasoon Joshi),” wrote Amitabh on Twitter along with the poem. After attending the funeral of Vinod Khanna, a sad Amitabh Bachchan took to his blog to pour out his heart over the loss of a friend. “I first saw him entering the Ajanta Arts office in Bandra, of Sunil Dutt, where I was making my way to seek a job .. a most good looking handsome young man .. a body in elegant frame .. a swagger in his walk .. and a gentle smile as he looked towards me .. it was 1969 .. he was working in the Ajanta Arts film, ‘Man ka Meet’ .. I was struggling to get a role, any role, anywhere ..In time we met again within the same precincts .. he and I were working in the same film of Dutt Saheb, ‘Reshma aur Shera’ .. look trials in the office of the film .. travel and sittings on the story .. Thapa saheb, Ali Raza, Sukhdev and those all night meets, most novel for me .. my first brush with the way the film industry functioned .. the time for the shoot and the excitement of travel on a location in Jaisalmer .. the months we spent together and after .. driving in the scorching heat of the deserts of Rajasthan to the location, Pochina, in the sands of nowhere near civilisation .. living under one tent – Vinod, Ranjit, Thapa Saheb, Ali Raza saheb about seven of us in the same tent .. then similar number at a make shift residence in the city of Jaisalmer – Amrish Puri joining us in that room filled with all of us, living laughing, working .. carefree days .. the rigors of that location and its environs ..
An incident at a restaurant in SoBo, where someone made a snide remark, and he took him on, getting knifed in the arm during the scuffle, but being victorious .. The sudden passing of his Father soon after our work together in ‘Reshma’ .. I being with him in his hour of grief .. and then .. the amazing chemistry of the several historic films that we did together .. an association that was so loveable and considerate .. spending time in each others make up rooms, sharing our lunch, just biding time and talking of all kinds of talk .. the late shoot pack ups and the beyond midnight drives to Juhu Beach, to just sit with our directors and he to have a drink, and I mine ( I used to in those days ) ..
That guilt ridden incident when I had to fling a glass in a scene towards him and it accidentally hitting his chin, cutting him open right through to his teeth .. the remorse regret and guilt within me to date for that unforgiving accident .. rushing him to his doctor, late at night, getting stitched up, driving with him to his house to settle him in and to just keep apologising for this horrific accidental slip .. The sudden brush with him as he ran up the stairs in Breach Candy Hospital, where I had gone to visit a friend, and his anger and grave faced expression – he learning of the accident of his close relative on a motorbike, and him wanting to be with her as she struggled for her life .. His friendly gesture of appearing in a film of mine ‘Zameer’ .. the times we spent on it at various locations .. the most rigorous being action sequences shot in the interiors of Udaipur, well into the night and dawn, with that most respected Action Coordinator Khanna Saheb .. after the sequence was filmed, Khanna Saheb sitting with us in the early hours of the morning and emotionally expressing his great joy in working with the two of us .. ‘give me these two artists in an action drama and I shall extract the best ever seen’ .. he would commend us .. The Hotel in Udaipur and our rooms distanced .. me away in one lonely corner and he in another .. I call him in the middle of the night and express the loneliness .. he inviting me over and saying to stay with him in his room .. for a newcomer you cannot imagine what this meant to me to be treated like this by a star .. His confident charm was infectious .. there was always an optimistic swagger about him .. a smile .. a laugh .. a casualness .. nothing seemed to disturb him one felt .. the relaxed ‘cool’ of today’s times .. The jigs we would invent on set .. impromptu songs .. when 5 Librans working together in the same film at the same scene would break into – Shammi Kapoor ji, Amjad, Kader Khan, Vinod and I – our little ditty, on the sets of ManMohan Desai’s “Parvarish” .. ‘We are crazy Librans .. **%#@!! up this film” .. !!! And the uproarious laughter that followed each shot that we gave together ..
And then one day his sudden decision to the following of Rajneesh .. his passion and the strength of his belief .. his sincerity in his following, right to California where Rajneesh had shifted .. I met him in Los Angeles during this period on a stray visit, and he spent hours at a common friend’s place explaining to me what the movement meant not just to him, but to the World in general ..
And this afternoon that association of 48 years came to an end .. Previous articleIs It Time For The Kapil Sharma Show To Shut Down Finally? Next articleRahul Khanna’s Cryptic Post Just 3 Days Before Vinod Khanna’s Death Said It All!